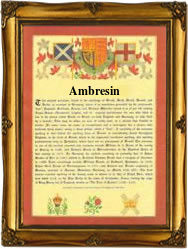 This ancient surname recorded as Ambrose, Ambrus, Ambrosius, Ambroix, Brosch, Ambroisin, Ambrosetti, Brogetti, Brozek, Ambrogioni and in over fifty other spellings world-wide, is of Ancient Greek origin. It derives from the personal name "Ambrosios", meaning divine or immortal, a meaning which no doubt assisted its great popularity. The first known holder was probably St. Ambrose (circa 340-394), the bishop of Milan and one of the early fathers of the Church. The name as a personal name, is recorded in the famous English Domesday Book of 1086, and later in the 1168 a.d. charters of the county of Norfolk, known as the "Pipe Rolls". The surname is first recorded in England in the 13th Century, England being the first country to adopt hereditary surnames, and to make regular recordings throughout the land. Today in the 20th century, the surname in all its various spellings, is recorded in every part of Europe, and throughout the Christian world. Amongst the earliest examples of the surname recording are William Ambroys of the county of Sussex in the year 1332, and in Germany Johann Ambrosius, who was recorded at Franken in 1525. In London in 1729 an unusual recording is that of Ambrosia Ambrose, who was married at St. George's chapel, Hanover Square. The first recorded spelling of the family name is believed to be that of Henrie Ambroys, which was dated 1273, in the ancient charters of England known as the "Hundred Rolls", for the county of Bedfordshire. This was during the reign of King Edward 1st, known as "The Hammer of the Scots", 1272 - 1302.